This event is an absolute must at our cider farm! Every year, on the last weekend of October, the farm is open to the public for demonstrations in cider-making. On Sunday, demonstrations in cider-making, tastings in the shop. A local farmers’ market is set up at the fair and visitors have the chance to sample local Perche products (cheeses, cold-cuts, jams, honey, poultry terrines, apples, etc.) and – of course - pancakes! Lunches are available (by reservation), with a choice of local platters, snacks, sandwiches, hot drinks, etc. 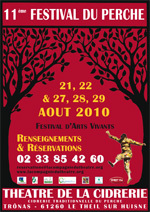 Every year in August, Nathalie and Dominique Plessis host the Festival du Perche in the Cider farm theatre, a great moment for adults and children alike. Alexandre Colas and Céline Codogno, who run La Compagnie du Théâtre, coordinate and organize the programme for the Festival du Perche. It is the opportunity for them to communicate their passion for the stage and invite other companies to do the same, by putting on plays for all age groups. Visitors are treated to brilliantly executed, professional performances of all different genres - from classical and vaudeville to the fantastical! Throughout the year, the Cidrerie Traditionnelle du Perche proposes a number of themed evening events: story-telling, a cider-style Saint Patrick’s Day, theatre, etc. The events take place generally the Saturday evening at 20:30. You can enjoy a snack at 19h:00 only on reservation, a delicious range of fresh farm produce (cold-cuts, cheeses, coffee or organic tea with cakes aso …) and sample our Ciders, Pear cider, apple juice. Nathalie and Dominique Plessis host a number of contemporary art exhibitions between 2000 and 2010, that were organized by Elisa Fiasca, webdesigner.